Welcome to the Advanced Optics Lab! Using novel optical tools, our goals are to understand cell motility and the regulation of cell shape. Regulating cell shape is important for many essential functions, including immunological defense (movie). We pioneered laser-based nanotechnologies, including optical tweezers, nanotracking, and laser-tracking microrheology. Applications range from physics, pharmaceutical delivery by phagocytosis (cell & tissue engineering), bacterial pathogens important in human disease and cell division. 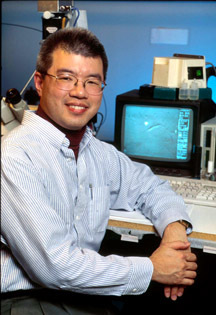 As Director of Imaging and Microscope Facility, I have additional research projects related to microscopy. We are developing laser-based super-resolution technology that could image fluorescent proteins with near-molecular spatial resolution within cells. However, fluorescence doesn't reveal the subcellular environment around these key proteins. Combined with high-pressure freezing (2000 atm and freezing within 15 ms! ), correlations between fluorescence and electron microscopy should provide outstanding images of subcellular structure around critical proteins.